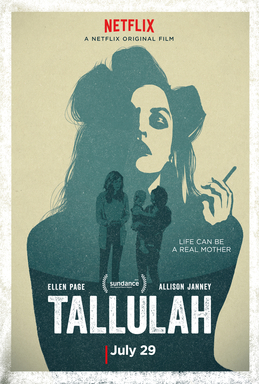 Netflix Original’s most recent releases include Tallulah, a heartfelt story of three women whose lives unexpectedly intertwine. Starring Ellen Page and Allison Janney, the film seems right at home on the streaming service that brought us Orange Is The New Black and Unbreakable Kimmy Schmidt, where nuanced depictions of women are fast becoming the norm. In fact, Tallulah writer and director Siân Heder counts OITNB among her previous writing credits, so it is no surprise that the film is of a similar quality. Tallulah (Lu, played by Page) has spent the past two years travelling the country in a van with her boyfriend Nico (Evan Jonigkeit), making do with dumpster diving and stolen credit cards. When Nico announces he is ready to ‘do something real’, starting with a return to New York to see his mother, Lu has no desire to do the same. That is, until Nico leaves anyway, and Lu makes the trip to New York to find him. She finds Nico’s mother Margo (Janney), but not Nico himself, in a stylish Fifth Avenue apartment. Turned away by Margo, Lu scrounges for scraps of room service in a nice hotel, where the troubled Carolyn (Tammy Blanchard) mistakes her for a hotel employee. Carolyn is about to go on a date with a man who is not her husband, and she offers Lu a hefty tip to babysit her one-year-old daughter Madison, in whom she shows little interest. When Carolyn returns drunk and passes out, Lu takes off with her cash, her jewellery, and her baby. What follows is a complicated, clever, and often sad story that treats its female characters with kindness while gently exposing the ways in which life does not do the same. Both Lu and Margo are guarded and abrasive, but funny and warm once they get used to each other — they find common ground despite their different life experiences. Page and Janney have a wonderful chemistry (picking up from where they left off in Juno) that really makes this film special. That theirs is the most interesting dynamic is a nice change from so many films focused on romantic relationships. Although Lu judges Carolyn as uncaring and unfit to be a mother, the viewer is shown that she may be struggling with something beyond her control. She so dearly wants love and attention, but is unable to provide it to her daughter. The tabloid press and child services officer Louisa Kinnie (played by Uzo Aduba) might pass judgment, but the film’s overall message is not that she is undeserving of sympathy; rather, she is in desperate need of help that no one seems willing to give her. Carolyn’s story makes for an interesting comment on society’s expectations of mothers and its lack of generosity when individual women fall short. The film is also somewhat ambivalent about Lu’s decision to take Madison; not condoning it, but understanding. Lu develops a strong connection to Madison and a genuine concern for her wellbeing. The audience also learns that Lu herself was abandoned by her mother, giving insight into her choices. It is testament to the film’s complexity that it manages to balance the perspectives of all three women, with no definitive moral high-ground. Janney as Margo is given some of the best scenes in the film, like when she drops her divorce papers in the bath and then proceeds to blow-dry each piece individually, and when she dons a pair of bright orange heels in an effort to seduce her building’s doorman. Margo is deeply resentful of her ex-husband Stephen (John Benjamin Hickey) and his new relationship with another man. In one heated conversation her anger strays into homophobia, which makes for uncomfortable viewing, and shows the audience one of her least likeable sides. In one of the best scenes in the film, Lu wonders aloud what would happen if gravity were to stop right where she was. She muses that she would grab onto a tree branch to stay on earth, but Margo doesn’t think she would hold on. This theme is present in several key moments in the film, and its symbolism adds depth to the story. Tallulah represents a meeting of several different worlds, and when Lu arrives in New York the contrast between her life in the van and the life she is entering is striking. Seeing Margo’s university-owned apartment through Lu’s eyes makes its trendy furniture and important artwork seem almost absurd. This is one of the most interesting dynamics in the film, because it levels the playing field between Lu and the world she is encountering. Netflix tells subscribers that this movie is “Emotional” and “Dark”, and while it is certainly the former, there is light to be found in its story and its characters. There are funny moments, and moments of human kindness among all the mistakes and the lies. These are what make watching Tallulah an ultimately uplifting experience, despite the sadness along the way.